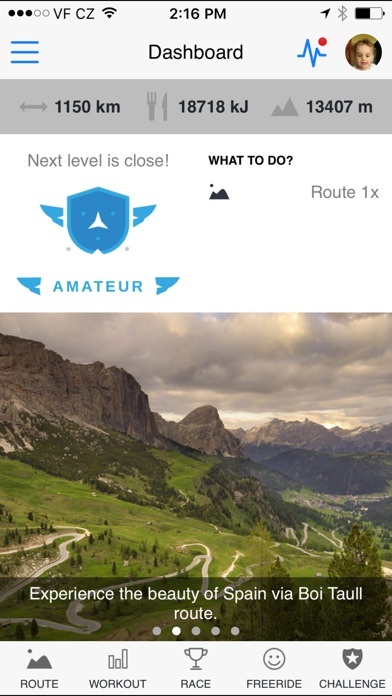 Turn a boring trainer ride into a fun outdoor adventure experience with the Rouvy app. ROUVY - INDOOR CYCLING REALITY Ride real routes from the most beautiful places in the world! 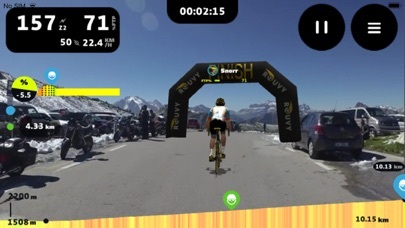 Rouvy allows you to compete in a race or train virtually anywhere with anyone! Using augmented reality, the app virtually brings remote riders together onto any road on the planet through animated 3D objects in 2D real videos. All you need is your bike and compatible trainer. HOW TO CONNECT For the best experience pair Rouvy to a smart or interactive trainer with brands like CycleOps, Wahoo Fitness, TACX, ELITE, Kinetic and more. You can also connect the Rouvy App using a classic trainer with a speed sensor or power meter. Check the compatibility of your setup here. ENJOY 14-DAYS FREE TRIAL Access and try all Rouvy features for free and with no credit card required. SUBSCRIBE TO THE MOST FEATURED APP FOR INDOOR CYCLING Rouvy Features: • Augmented Routes - Premium video routes with animated 3D Objects and Riders based on augmented reality (available in Public Beta) • Virtual routes - Thousands of High-quality GPS synced video routes from the most famous and beautiful places for cycling. You can also create your own route and share it with friends. • Workouts - Variety of structured workouts based on power intervals. Create your own workout or follow Rouvy Guides with premium video footage. You can also sync your TrainingPeaks workouts. • Career - Stay motivated all year long as you build your career on Rouvy. Become a Legend and enjoy exciting rewards (up to $10,000 in some of the best training products Rouvy partners have to offer) as you progress in your career. 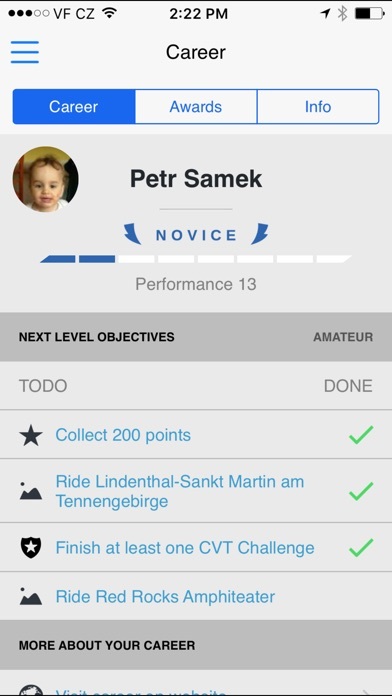 • Challenges - Find and enjoy non-stop fun and friendly competition as you improve and become a better cyclist. Enjoy some exciting prizes (up to $10,000 in value) for branded challenges! • Advanced Pedal Analytics - Improve your pedal technique with Rouvy Virtues. 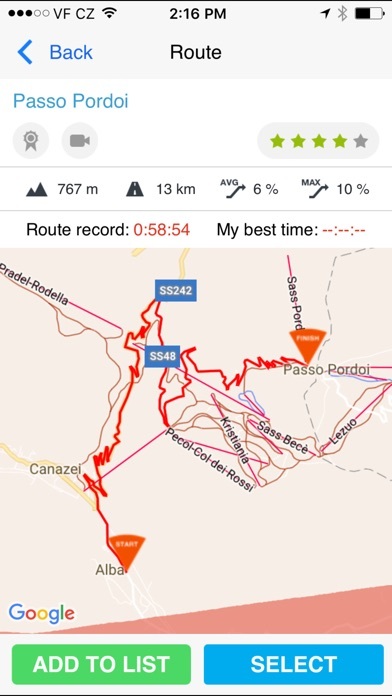 •Training Diary - manage and analyze your training agenda and share it with your friends within the Rouvy community • Route and Workout Creator - Create your own workout or video route in Rouvy editor, you can monitor your actual power output compared to the planned intensity. • Group Rides - Don´t ride alone on your trainer, join or create a group and have fun by riding together in the Augmented Routes. • Online Races - Improve your performance by chasing others. Nothing beats seeing your competitors in front of you. Take a part of the Online Race or invite others to your own. 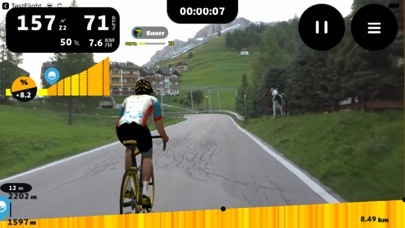 • Synchronize your training data with Strava, TrainingPeaks or other training apps. Loving this new platform. I started on Zwift but find that I prefer the Rouvy experience, as it feels less like a video game and more like I am riding outdoors. Simple. Direct. Enjoyable. Tough workout. It is part of three I do daily. Sets me up just righ for the day. I ride much more now on my trainer since I am able to explore the world. I cannot get the app to detect my Kinetic Smart 2 Bluetooth sensor. Trying from my iPhone. Yes, Bluetooth on and sensor works with other apps. This only works with a list of special trainers. If you just have a standard exercise bike, use Bit Gym instead. I can’t speak for the app itself as I’m only using it to calibrate my trainer but signing up for this system was terrible. First you cannot sign up on the website at all without download there software which does not work on Mac . So Mac users have to use those phone. The sign up page in the app is linear and you can’t paste or go back. Typed your username wrong? Too bad reload the signup page and start over! Did you click the confirm password box instead of password as the app slowly moves the boxes around like a bad click bait page? Too bad now you have to restart but you CANT go back up to the password box. It’s 2019 have you started using a password manager to secure your passwords? Your password is some long ugly thing on your clipboard? Well your can’t paste it into the boxes. Enjoy going back to the Stone Age and typing your password in. FINALLY get everything filled in and your ready to sign up. The excellent up designers put a login button In green that will ERASE everything you typed and make you start over. Complete garbage experience. Like the rides but hate having to constantly mirror to apple tv. Fulgaz and swift have apple tv apps. When will the app for apple tv be developed? You have to download and sign up using the app. You cannot sign up via their website. I am trying to enter the username, email and password in order to create my account and sign up but I can even do that since the app “disables” some of the fields like password or the password confirmation randomly. I have tried multiple times to no avail. If I can’t even sign up, what am I expecting in terms of performance and stability with this app/service. Recently purchased a Smart Trainer - Wahoo Kickr Snap. Tried Zwift but not a fan of Virtual Reality. Rouvy uses Augmented Reality. I love riding Real Routes against other riders. I have even loaded my own routes. Never before have I been able to train indoors for much more than a half hour. Now I can ride up to 2 hours. Highly recommend it.